Dr. Ali Alibakhshi received a B.S. in Engineering in 1982 from West Virginia Institute of Technology and M.S. in Engineering in 1989 from the University of Tennessee. In 1997 he received his D.D.S. from Howard University College of Dentistry. Dr. Alibakhshi has pursued continued training and education to expand his skills in dentistry, including courses in advanced professional implant training. Dr. Alibakhshi is a member of the Academy of General Dentistry and certified in oral Conscious Sedation. Dr. Ali Alibakhshi, or Dr. Ali as he is known by his patients, is a gentle, caring dentist who places a strong emphasis on getting to know each individual patient. 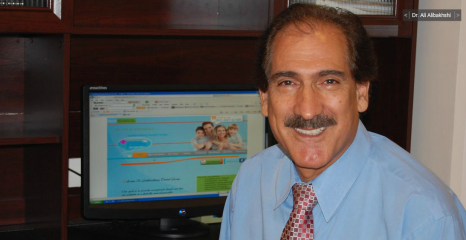 Dr. Ali firmly believes that treating patients involves treating both the body and the mind; he strives to employ respect and kindness in every facet of dental care. Dr. Ali believes a great relationship between himself and his patients will set them at ease in knowing they are in good hands. Dr. Ali strives to give every patient a beautiful, healthy smile.